Estreno Catering has provided catering to private and corporate clients from large conferences to intimate dinners across the nation. We offer world-class service with a menu that will fit any budget and satisfy the taste of each and every guest. Off-Site Catering Our team of passionate chefs, cooks, servers, and sales agents will guide you through customized menus, budgeting options, logistical planning, and theme design. Each aspect of your event is carefully and artfully crafted to build a perfect experience for your guests. 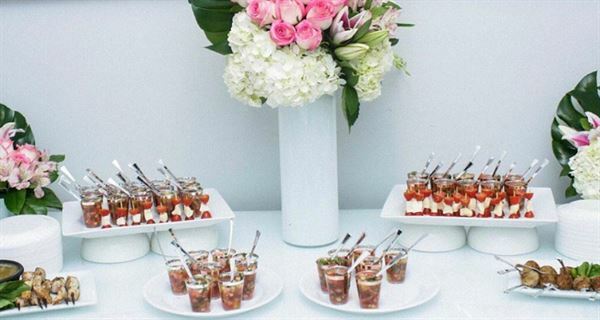 Picture-Perfect Events Estreno Catering is able to plan and produce events that will go above and beyond your vision, all while maintaining a comprehensive site on your budget. From decor selections, setup, staffing, and entertainment, we guarantee that your guests will rave about your event long after they leave. Our packages boast a variety of options and customizability. Regardless of event type, Eastmark is able to provide great prices with great value and is sure to impress you and your guests.